THERE is good news for heart patients requiring bypass surgery on the aorta, the main artery which carries oxygenated blood from the heart to the rest of the body. British researchers have recently developed a technique that uses plastic tubes, called catheters, to insert synthetic grafts into the blood vessel, thus eliminating the 'need for a bypass surgery (New Scientist, Vol 146, No 198 1). Thousands of people are known to die each year due to rupture of aorta, the body's main artery. The walls of aorta tend to become weak with old age and often tend to balloon out. When the diameter of the balloon reaches a certain critical size - which is usually about 6 centimetres - the doctors say that there is a big risk that it may burst. 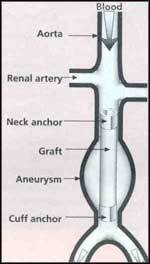 These weak spots, also known as aneurysms, have to be relieved by a bypass surgery before they reach the critical size. Anthony Fox, a vascular surgeon with the University of Bath's department of surgery now claims to have developed a prototype which he says will be ready for tests on people in a few months. Fox's system is unique because the polyester graft is reinforced by a 'shape memory alloy' called nitinol - a mixture of nickel and titanium. When the graft is placed at the desired location and the catheter removed, the nitinol comes in contact with the blood whose temperature helps the graft to expand its ends against the wall of the main artery, thus stationing it at the neck and cuff.